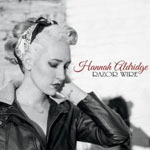 Share the post "Album review: HANNAH ALDRIDGE – Razor Wire"
‘Dark Americana’ is how Hannah Aldridge – daughter of esteemed Muscle Shoals/ Nashville songwriter and producer Walt Aldridge – describes her gritty, uncompromising debut. Recorded in analogue (naturally) in Nashville (where else?) she’s backed in the studio by a core band of players in the form of Andrew Sovine (electric and acoustic guitars and lap steel), Lane Baker (bass), Brad Pemberton (drums) and Andrew Higley (keys) whose collective delivery makes Razor Wire a little unusual for the genre in that it mixes southern rock with a healthy infusion of country and blues. And a few delicate acoustic numbers (naturally) – the ‘bonus’ title track reprise outshining the full band version by a country mile. Add Aldridge’s Southern home-smoked vocals and it’s a lustful and addictive brew. Combined with Aldridge’s sassy lyrical alter ego (she’s a nice girl really), Razor Wire punches way above it’s weight in the Americana stakes, with one dusty booted foot placed firmly in the door to the rock side of the border. On the one cover on the album – fellow Shoals’ native Jason Isbell’s ‘Try’ – his band, The 400 Unit, guest and let loose with a power that would surely hold it’s own against the imminent Zep archive recordings. This entry was posted in ALBUM REVIEWS, ALBUM REVIEWS (Mobile), All Posts and tagged album, Americana, country, Hannah Aldridge, Nashville, Razor Edge, review, rock, roots, singer, songwriter. Bookmark the permalink.